Hilary Byerly is a Masters student at Cornell’s Dyson School and a research assistant for the Tata-Cornell Agriculture and Nutrition Initiative (TCi). The narrative of the Green Revolution in India is familiar to agricultural development practitioners. High-yield varieties of wheat and rice introduced in the 1960s, along with access to modern inputs such as fertilizer and irrigation, doubled cereal production (Hazell 2009). A country that was plagued by famine in the first half of the 1900s became self-sufficient in calorie production by the end of the century. Yet India remains one of the most malnourished nations in the world. Rates of childhood malnutrition are double those in Sub-Saharan Africa and nearly five times those in China. Sixty million children are underweight, nearly half of whom live in just four of India’s 27 states. The growth in production has had uneven impacts across the country, and many communities still go hungry or malnourished today. Using almost half a century of data on area and production of major crops at the district level from ICRISAT’s VDSA database, TCi has mapped this evolution in farming. Comparing the landscape across time illuminates patterns of how and where agriculture has changed in India, perhaps enabling more targeted interventions to address the shortcomings of the last fifty years. In the mid-1900s most of India practiced subsistence agriculture, cultivating coarse cereals, rice, and pulses with limited inputs. As Figure 1 illustrates, the proportion of area under cereals was relatively even across the country in the late 1960s. Intensive investment in rice and wheat during the Green Revolution focused production of these crops in areas endowed with a certain resources and infrastructure, primarily across the plains of northern India. By the late 2000s cereal production was clearly concentrated in the north (Figure 1), and cultivation of more nutritious crops such as pulses had been abandoned there in the process (Figure 2). Pulses, though, seemed to have moved southward. 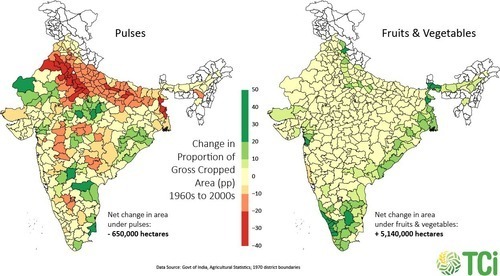 Overall area under pulses has remained about constant–decreasing just 650,000 hectares, or 3%, from the 1960s to the 2000s. Rising incomes and changing diets in India over the last few decades have increased demand for fresh produce, dairy, and meat (Pingali 2007). Consequently, production of fruits and vegetables has expanded (though slowly) in southern and eastern regions (Figure 2). 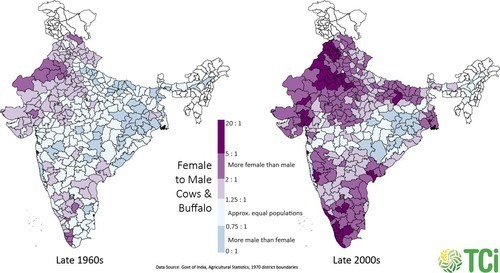 Likewise, there has been a striking increase in the number of milk-producing animals (cows and buffalo) relative to their male counterparts (Figure 3). Milk and vegetables are important sources of micronutrients, key to addressing iron and vitamin deficiencies that plague most of India’s poor. 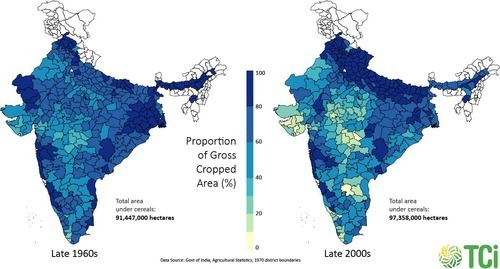 Yet Figure 3 shows a clear disparity: the impoverished and malnourished districts of central and eastern India remain almost unchanged after forty years. Statistics can highlight need—the number of people in poverty, a percentage of households suffering from malnutrition, the tonnage of rice lost to drought—but their spatial distribution is far more illuminating. Mapping this data indicates where need is greatest, which regions suffer more relative to others, and exceptions that buck the trend of their neighbors. Insights into the spatial patterns of food production can inspire research and advocacy for more targeted interventions for malnutrition in the parts of India that need them most.